Daniel Boone is an American action-adventure television series starring Fess Parker as Daniel Boone that aired from September 24, 1964, to May 7, 1970, on NBC for 165 episodes, and was made by 20th Century Fox Television, Arcola Enterprises, and Fespar Corp. Ed Ames co-starred as Mingo, Boone's Cherokee friend, for the first four seasons of the series. Albert Salmi portrayed Boone's companion Yadkin in season one only. Country Western singer-actor Jimmy Dean was a featured actor as Josh Clements during the 1968–1970 seasons. Actor and former NFL football player Rosey Grier made regular appearances as Gabe Cooper in the 1969 to 1970 season. The show was broadcast "in living color" beginning in fall 1965, the second season, and was shot entirely in California and Kanab, Utah. 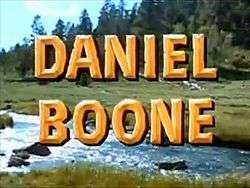 An earlier television series based on Daniel Boone appeared on the Walt Disney Presents in 1960, with Dewey Martin as Boone. Daniel Boone was one of two iconic historical figures played by Fess Parker. He previously appeared as Davy Crockett in a series of episodes of the Walt Disney anthology television series, to considerable acclaim amid the launch of a national craze. For his role as Boone, which lasted much longer, but had far less impact, Parker again wore a raccoon-hide coonskin cap, which had been popularized years earlier by the Crockett shows. Daniel Boone's headgear was even mentioned in the show's theme song: "From the coonskin cap on the top of ol' Dan....". Efforts had been made to secure the rights to Crockett from Walt Disney, but Disney refused to sell, so the series wound up being about Boone instead. In contrast, Parker's Boone was less of an explorer and more a family man than Parker's Crockett. Parker as Crockett also generally wore a light beard, whereas his Boone was predominantly clean-shaven. Boone's wife Rebecca (played by Patricia Blair) and son Israel (Darby Hinton) were often featured in the stories. In reality, Boone had 10 children. During the first two seasons, his daughter Jemima was shown (played by Veronica Cartwright), but she disappeared with no explanation toward the end of the second season. Western actor Chris Alcaide appeared twice on the series, once as an Indian, Flathead Joseph. Walter Coy made his last major television appearance in 1970 on Daniel Boone in the role of Chief Blackfish. Rico Alaniz played the Indian Crooked Hand in the 1969 episode "The Allies". The series is set in the 1770s-80s, just before, during, and after the American Revolution, and mostly centered on adventures in and about Boonesborough, Kentucky. Some aspects of the show were less than historically faithful, which at one point led the Kentucky legislature to condemn the inaccuracies. Inconsistencies include episodes such as "The Aaron Burr Story", a second-season episode in which the former Vice President of the United States visits Boonesborough. The episode was based on Burr's raising an armed group, allegedly to commit treason, in 1806. Meanwhile, another episode in the second season hinged on allegations that the Boonesborough settlers were planning insurrection against the British Crown, prior to the American Revolution. Still other episodes took place during the Revolution. No explanation was made for the 30-year discrepancy. The character Caramingo, shortened to Mingo was half-Cherokee, but highly educated somewhat in the Tonto mold, but with updated sensibilities and English descent through his father. (A graduate of Oxford University, Mingo passed as a British officer in at least two episodes, and sang opera in another.) In reality, the Mingo were a small group of natives (and not one man) who were related to the Iroquois. (However, from the native perspective, mingo is a word for "chief" in the Choctaw native language; and in Chickasaw, minko is the word for "chief"). Ames also portrayed Mingo's evil twin brother, Taramingo, in "My Brother's Keeper". His role as Mingo led to a famous tomahawk-throwing demonstration on The Tonight Show, that was rerun on anniversary clip shows for decades afterward, in which Ames threw a tomahawk at a target of a man and the hatchet landed between the cutout's legs, much to host Johnny Carson's amusement. Mingo's character resembles Mohawk Joseph Brant. Brant was a Mohawk Indian, who became a captain in the British Army. His sister, Molly, was the consort of Sir William Johnson, of Johnstown, Montgomery County, New York. Johnson took an interest in Molly's younger brother, acting as a surrogate father, and sent him to Moore's Indian Charity School, the precursor to Dartmouth. Brant was, therefore, well educated for men of his time, and exceptionally well educated for a Mohawk. A project in later years was to work on a Mohawk translation of the Bible. Brant's parents were both First Nation people, unlike Mingo. Brant, despite his role in the American Revolution, is largely unknown outside Central New York, although he is a national hero in Canada. In Ontario, along Lake Ontario's shores, between Toronto and Niagara Falls, a town and hospital are named after him. A replica of his Canadian home, is located next to Joseph Brant Memorial Hospital. It is possible that any similarities are coincidental. Boone's character needed a First Nation companion, and, as the show was produced in the United States, the character needed to support the rebelling colonists to be believable as a Boone's friend. Giving Mingo an education, a better one, incidentally, than Fess Parker's Boone, distanced Mingo from the traditional Western violent uneducated savage stereotype. If creators were unaware of Moore's Indian Charity School, a British father would have been the easiest way to explain Mingo's background. Status in First Nation tribes is through women. A First Nation mother and a British officer father provided status in both worlds. Nothing indicates that Brant was the basis for Mingo, and there are notable differences, starting with Brant's stance as a Loyalist, but Mingo closely resembles Brant. One strange oddity to the show was that Parker's Boone very rarely used a horse for transportation. He would, instead, walk to his destination, sometimes incurring interstate travel. The show's main title featured three versions of the theme song written by Vera Matson and Lionel Newman (although the lyrics were written by Ken Darby, credited under the name of his wife Matson). The third "groovy version" was sung by The Imperials. Two boxed season sets of Daniel Boone starring Fess Parker were released on DVD on September 26, 2006, 186 years to the day of the American pioneer-hunter's death. A third-season boxed set was released on May 8, 2007, followed by a fourth-season boxed set on June 19, 2007. A fifth-season boxed set followed in August. Season six was on DVD on November 18, 2008. The complete series box set was released in September 2014. Daniel Boone is currently airing on INSP. As of fall 2016, it is airing on MeTV, or Memorable TV, a station located in NJ, whose offerings are older syndicated television shows. ↑ ""The Allies", Daniel Boone, March 27, 1969". Internet Movie Data Base. Retrieved May 15, 2014. ↑ "Daniel Boone Theme Song". Retrieved March 20, 2010. ↑ "Mingo". June 28, 2008. Retrieved March 20, 2010. Wikimedia Commons has media related to Daniel Boone (television series).